Sorry for the lack of posts the past several days. I've been under the weather. My meals have consisted of premade soups. But luckily being sick or confined to a liquid diet isn't limited to just chicken noodle soup (which I've never liked). A variety of flavors now line the grocery store shelves like butternut squash, lentil, roasted red pepper, thai coconut, or miso soup. My favorite soup lately is Amy's Organic Black Bean Vegetable soup (low fat version). Throw a dollop of sour cream on top with a piece of toast on the side, and you have a fast, delicious meal. Today for lunch I made a hot bowl of Pacific's Creamy Tomato and a honeycrisp apple with peanut butter on the side. 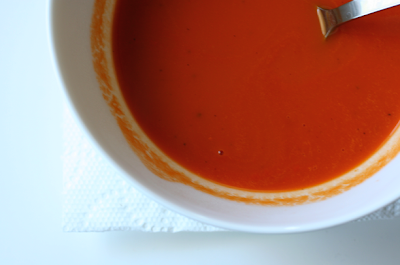 There's something comforting about the simplicity of tomato soup. I guess it reminds me of childhood. My mom would whip up Campbell's tomato soup with grilled cheese for a quick dinner for me and my siblings. But these days, I don't buy Campbell's due to the preservatives and high sodium content (I know there's also a low sodium version too). My cupboards are full of Amy's, Imagine or Pacific brands during the winter months. They have low sodium, organic versions that taste better than I remember as a kid. Organic wasn't an option back then. CHECK US OUT AND JOIN THE REVOLUTION. WE HEAR SO MUCH BAD NEWS IN THE WORLD. HELP US INSPIRE THE WORLD IN 25 DAYS THROUGH RANDOM ACTS OF KINDNESS.